F. J. Duarte and R. O. James, Organic dye-doped polymer-nanoparticle tunable lasers, in Tunable Laser Applications, 3rd Ed. (CRC, New York, 2016) Chapter 4. 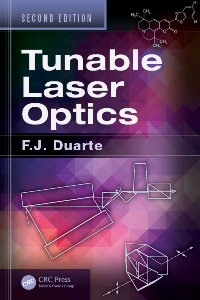 F. J. Duarte, Pulsed narrow-linewidth tunable laser oscillators, Tunable Laser Optics, Second Edition (CRC, New York, 2015) Chapter 7. F. J. Duarte and A. Costela, Dye lasers, in Encyclopedia of Modern Optics, B. D. Guenther, Ed. (Elsevier, New York, 2004) pp. 400-414. F. J. Duarte, Pulsed narrow-linewidth tunable laser oscillators, Tunable Laser Optics (Elsevier Academic, New York, 2003) Chapter 7. F. J. Duarte, Multiple-return-pass beam divergence and the linewidth equation, Appl. Opt. 40, 3038 - 3041 (2001). F. J. Duarte, T. S. Taylor, A. Costela, I. Garcia-Moreno, and R. Sastre, Long-pulse narrow-linewidth dispersive solid-state dye laser oscillator, Appl. Opt. 37, 3987-3989 (1998). F. J. Duarte, Multiple-prism near-grazing-incidence grating solid-state dye laser oscillator, Opt. Laser Technol. 29, 513-516 (1997). F. J. Duarte, A. Costela, I. Garcia-Moreno, R. Sastre, J. J. Ehrlich, T. S. Taylor, Dispersive solid-state dye laser oscillators, Opt. Quantum Electron. 29, 461-472 (1997). F. J. Duarte, Compact solid-state dye laser oscillators, in Optics in 1995, B. Guenther, Guest Editor, Optics and Photonics News 6(12), 33 (1995). F. J. Duarte, Solid-state dispersive dye laser oscillator: very compact cavity, Opt. Commun. 117, 480-484 (1995). F. J. Duarte, Opportunity beckons for solid-state dye lasers , Laser Focus World 31(5), 187-189 (1995). 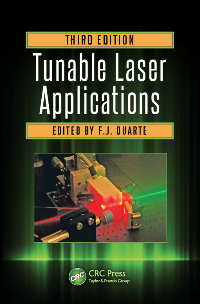 F. J. Duarte, Dye lasers, in Tunable Lasers Handbook, F. J. Duarte, Ed. (Academic, New York, 1995) pp. 167-218. F. J. Duarte, Narrow-linewidth oscillators and intracavity dispersion, in Tunable Lasers Handbook, F. J. Duarte, Ed. (Academic, New York, 1995) pp. 9-31. F. J. Duarte, Solid-state multiple-prism grating dye-laser oscillators, Appl. Opt. 33, 3857-3860 (1994). F. J. Duarte and R. O. James, Spatial structure of dye-doped polymer-nanoparticle laser media, Appl. Opt. 43, 4088-4090 (2004). W. Holzer, H. Gratz, T. Schmitt, A. Penzkofer, A. Costela, I. Garcia-Moreno, R. Sastre, and F. J. Duarte, Photo-physical characterization of rhodamine 6 G in a 2-hydroxyethyl methacrylate methyl methacrylate copolymer, Chem. Phys. 256, 125-136 (2000). F. J. Duarte, A. Costela, I. Garcia-Moreno, R. Sastre, Measurements of dn/dT in solid-state dye-laser gain media, Appl. Opt. 39, 6522-6523 (2000). F. J. Duarte and E. J. A. Pope, Optical inhomogeneities in sol-gel derived ORMOSILS and nanocomposites, Ceramic Transactions 55, 267-273 (1995). F. J. Duarte, Optical homogeneity and thermal properties of solid-state matrices for dye lasers, Optical Society of America Annual Meeting, Santa Clara, 1999, Supplement to Optics & Photonics News 10(8), 125 (1999). F. J. Duarte, Optimized architectures for narrow-linewidth dispersive solid-state dye laser oscillators, Optical Society of America Annual Meeting, Santa Clara, 1999, Supplement to Optics & Photonics News 10(8), 139 (1999). F. J. Duarte, T. S. Taylor, A. Costela, I. Garcia-Moreno, R. Sastre, Solid-state dye laser oscillators: long-pulse lasing, Optical Society of America Annual Meeting, Baltimore, 1998, Supplement to Optics & Photonics News 9(8), 109 (1998). 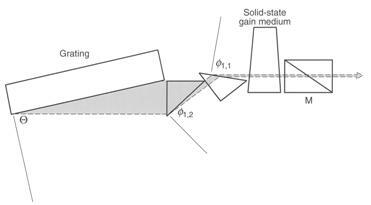 F. J. Duarte, Compact multiple-prism near grazing-incidence grating solid-state dye lasers, Optical Society of America Annual Meeting, Long Beach, California, 1997, Supplement to Optics & Photonics News 8(8), 166 (1997). F. J. Duarte, Compact narrow-linewidth solid-state dye lasers, INVITED PLENARY PAPER,in Proceedings of the International Conference on Lasers '95, V. J. Corcoran and T. A. Goldman, Eds. (STS, McLean, VA, 1996) pp. 329-334. F. J. Duarte, A. Costela, I. Garcia-Moreno, R. Sastre, E. Saravia, I. Olivares, Dispersive narrow-linewidth solid-state dye laser oscillators incorporating dye doped HEMA:MMA matrices, Optical Society of America Annual Meeting, Rochester, NY, 1996, Supplement to Optics & Photonics News 7(8), 133 (1996). F. J. Duarte, Narrow-linewidth solid-state dye laser oscillators, Optical Society of America Annual Meeting, Dallas, TX, 1994, Supplement to Optics & Photonics News 5(8), 90-91 (1994). F. J. Duarte, Solid-state dye laser oscillators, in Proceedings of the International Conference on Lasers '93, V. J. Corcoran and T. A. Goldman, Eds. (STS, McLean, VA, 1994) pp. 400-404. F. J. Duarte, J. J. Ehrlich, W. E. Davenport, T. S. Taylor, J. C. McDonald, A new tunable dye laser oscillator: preliminary report, in Proceedings of the International Conference on Lasers '92, C. P. Wang, Ed. (STS, McLean, VA, 1993) pp. 293-296. Page published on the 3rd of May, 1998.; Last updated on the 27th of September, 2016.